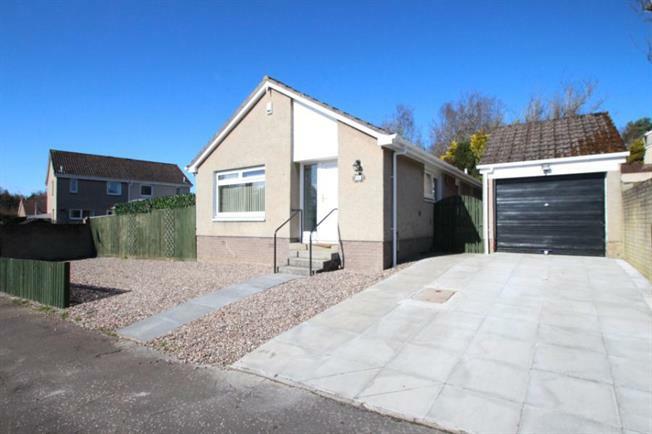 3 Bedroom Detached Bungalow For Sale in Glenrothes for Offers Over £168,000. This detached bungalow is located within the sought after Balgeddie residential area of Glenrothes and is conveniently placed for the amenities of Glenrothes as well as road links throughout Fife and beyond. Presented in good decorative order, the accommodation comprises of entrance vestibule with cloak/storage cupboard, bright lounge with window to front and French doors to side deck allowing ample natural light. There is a central dining room with access to a fitted kitchen, bedroom 3 with fitted wardrobes & to an inner hall. The kitchen is fitted with base and wall units, complimentary work surfaces, integrated ceramic hob, oven and extractor with space for further free standing appliances and an external access door to side of property. The inner hall provides access to two further double bedrooms and the family bathroom with the main bedroom benefitting from an en-suite shower. Externally, the front of the property has been paved and chipped to provide ample off-street parking and leads to a detached single garage with side door. A side path leads to the enclosed rear and side gardens which are laid mainly to lawn with deck and patio areas.